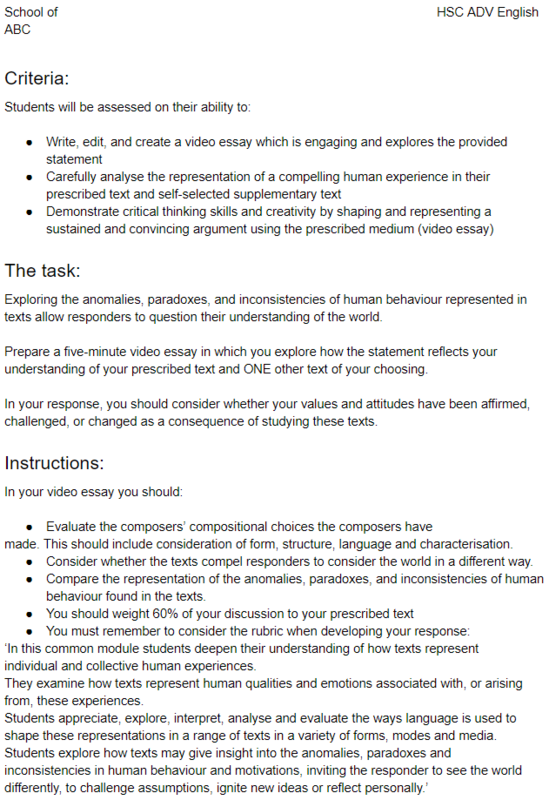 Have you been set a video essay for English and don't know where to start? You're not alone. In this post, we give you the tools to impress with your next video essay. So, you’ve been set a video essay as an assessment task. But what does that mean, exactly? In this post, we’re going to give you the ultimate video essay checklist complete with examples, step-by-step processes, and links to really useful online tools and resources to help you ace your next video essay. 1. Have you brainstormed, researched, and planned? 2. Have you planned your evidence and examples? 3. Have you planned the structure of your video essay? 4. Have you written the first draft of your video essay script? 5. Have you sourced your video/audio clips and images? 6. Have you edited the first draft of your script? 7. Have you written the second draft of your script? 8. Have you rehearsed your script and made any final edits? 9. Have you recorded your video and audio? 10. Have you edited your video together? In this post, we’ll give you detailed advice for each question above. But before we work through this video editing checklist, we need to make sure you understand what a video essay is by answering some common questions. Do you know what a video essay is? A video essay is a video, or in some instances a multimedia text, that presents an argument or discursively explores an idea or thing. Unlike written essays, video essays combine written and oral arguments with film, sound, and images. Video essays are a relatively new genre of visual essay. They are usually about 4 or 5 minutes long and either give a broad introduction to a subject or focus one specific idea. In video essays, authors narrate a video which advances their argument. This is laid on top of a series of visuals – still image, video clips, video of the creator – so that all these components combine together to advance the argument. As a form of information, video essays are engaging and accessible. They tend to avoid jargon and unnecessary meta-language as they are produced for a wide viewership. Why would I need to make a video essay? 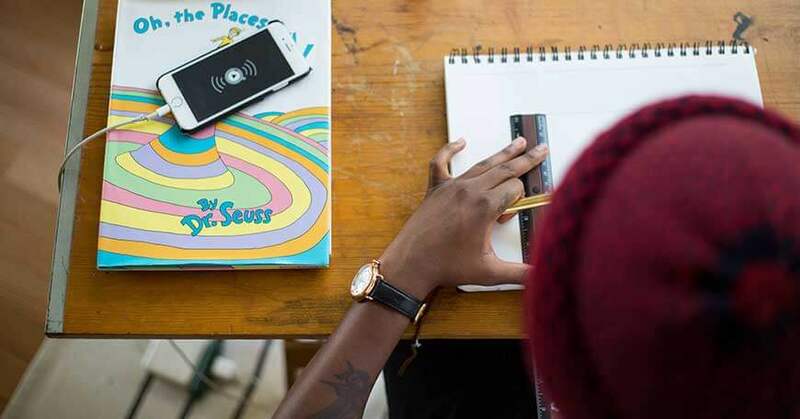 The new 2019 English Syllabus introduced a mandatory assessment – the multimodal presentation. Multimodal presentations require students to give an oral presentation that also includes a visual element – such as a PowerPoint presentation or other set of slides, or a poster. In addition, one of the best tools for learning is to educate others. if you want to check your knowledge on a subject or idea, you should try and teach others. A video essay is a means of doing this. Before you start trying to produce your own video essay, you should take a look at some examples of other high-quality essays. Where can I find examples of video essays? Video essays have become an increasingly popular way of communicating information about a topic. YouTube is full of video essay channels. Some are long, others are quite short. Because your school task will only be a few minutes, we’ll focus on the shorter ones. Every Frame a Painting: This was a great series that explored different aspects of film. It was produced by Taylor Ramos and Tony Zhou and ran from April 2014 to September 2016. Vox’s Earworm: Produced by Vox Media, this is a series of insightful and engaging video essays by Estelle Caswell that explores the history of popular songs and genres. 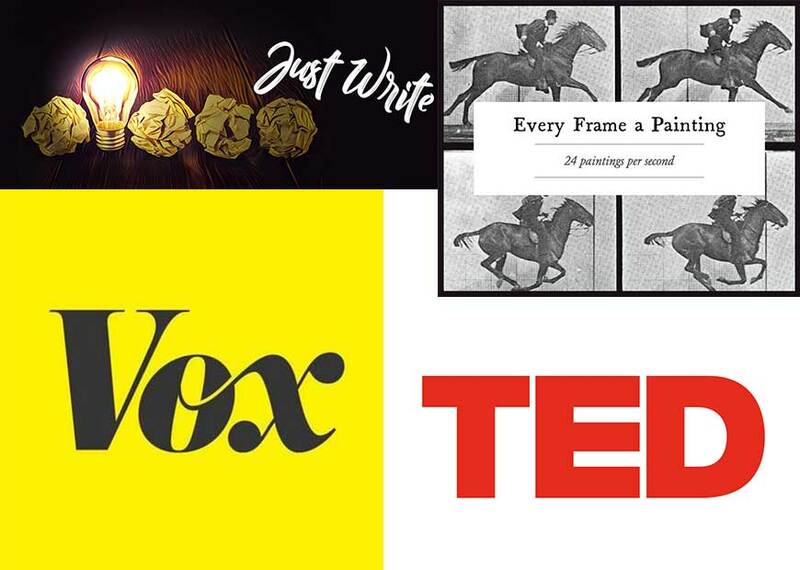 Vox Media: Vox is news and culture website that has ventured into video essays with channels like Earworm. They have a huge array of videos on an extensive number of topics. All are high quality. Just Write: A channel of video essays about literature and film by Sage Hyden. His videos are always engaging and well-produced. This one on Cyberpunk is an absolute doozy. TedEd: A spin-off of the Ted Talk phenomenon, TedEd are educational video essays that inform about a variety of subjects. Matrix’s English Academic Head, Peta Greenfield, wrote and narrated these two on The Ancient Roman Vestal Virgins and the historical legacy of Augustus. There are many more channels that you can find covering everything from baking and knitting to political economy and video games. Before you start putting your essay together, you should watch a wide selection of video essays on topics that you are interested in or are relevant to your studies. This will allow you to see how they are structured and paced. Now you know what you’re trying to produce, you need to think about the tools you’ll need. What sort of tools and equipment will I need for a video essay? Video essays will obviously require more tools than a pen and paper. Let’s have a look at the equipment and software tools and apps you’ll need to make one. First, here’s a list of equipment you will need or will find useful to make a video essay. Now we need to look at the software available for you to use. You will need some kind of video editor, the rest are suggestions to add pizzaz to your video. Powtoon – An easy to use online cartoon and video editing suite. it comes with built-in animations. Prezi – An animated presentation app. Think dynamic PowerPoints. 4. Have you written a first draft of your video essay script? 7. Have you written a second draft of your script? As you can see, there are three stages to this process: planning, drafting, and production. When you are producing something like a video essay that has many moving parts it is really important that you take the time to plan things in full and draft things thoroughly. You don’t want to be re-editing or rerecording audio when you are time poor and stressed! So, now you know what you need to do. Let’s show you how to do it! ✓ 1. Have you brainstormed, researched, and planned? As you can see, a video essay might sound different and fun – and it is – but it is also a fair bit of work. Exploring the anomalies, paradoxes, and inconsistencies of human behaviour represented in texts allow responders to question their understanding of the world. You will need to consider which “anomalies, paradoxes, and inconsistencies of human behaviour” are best reflected in your text. To do this, you will need to have a thorough understanding of your text and the Common Module: Texts and Human Experiences rubric statements. If you haven’t already, you should check out Part 1 of our English Advanced Study Guide – Common Module: Texts and Human Experiences. Once you know what topic you are going to discuss, you’ll need to decide what your argument will be. To do this, you’ll need to think about whether you agree or disagree with the provided statement. You’ll need to support this with the content of your video essay. You’ll need to plan out what you want to include in the video essay. This will include what ideas or points you will need to make to support your argument. You’ll only have 3-5 minutes for your video. This means you’ll want to focus one or two points that support your overall thesis. You’ll need to think about what visual elements you can use to make your points and make your video engaging for your viewers. Your video essay needn’t be restricted to you narrating your speech over the video. You can add depth and excitement to your video essay by utilising appropriate audio features. ✓ 2. Have you planned your evidence and examples? Before you can write your draft script, you need to organise the examples and other pieces of evidence that you may need. This should be relatively straightforward once you’ve analysed your texts. Well, that depends on the length of your speech. You want to aim to deliver your speech at around 130 words per minute. So, If you have a four-minute speech, you want to aim for 520 words. You probably only want to discuss four examples, at most. 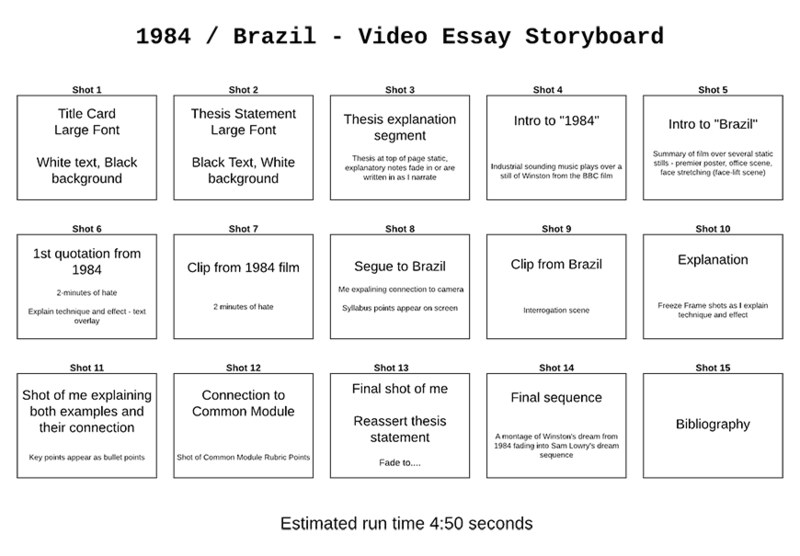 That gives you 100 words to unpack and analyse each of the examples and connect them to the main idea of your video. How do I pick the right examples? As you have very little time, you want to aim for detail and specificity. This means that you want to have good examples that pack in a lot of meaning. Does this example support my thesis? – Because of the short run-time of the video, it’s important that all of your examples and arguments support your core idea. Is this example using a higher order technique? – You can only include a handful of examples, so you want to make sure they present a compelling argument. You don’t want to be hanging an important argument on an example of alliteration is there is a consistent motif or unusual metaphor being used to convey the same idea. Remember, the important thing with short presentations is to make a consistent argument about your thesis and unpack a few examples in detail to support it. If you keep this in mind, it will help you select the right examples to use. ✓ 3. Have you planned the structure of your video essay? Before you write a script, you need to plan out what you will talk about and when. It will help you to create a storyboard. A storyboard is a visualisation of the order of scenes that you will present on film. When you plan an essay, you note down what your argument will be, what order you will use to discuss your themes, and you plan out your examples. A storyboard does the same thing for a visual text. Designing a storyboard will help you visualise the order of the shots that you need to make a convincing and well-structured essay. Image: A sample storyboard. Each square cell in the storyboard represents a segment or clip in the video essay. How do I plan my storyboard? Introduction – Plan a couple of shots where you introduce yourself, your thesis, and your texts. Body – You want to have one shot that introduces your specific idea. Then you need to have a shot that presents an example and unpacks it. You may want static slides or you may want an example from a film. The sample storyboard above uses a combination of shots. Conclusion – You need a couple of shots to summarise your argument. You’ll also need a slide which presents a bibliography citing where you got your examples and any audio or video clips from. You can draw a storyboard by hand. If you want the flexibility of dragging things around and re-organising things in case you need to restructure it, you could use a flowchart program like Lucidchart (this is what we used to create the simple storyboard above). ✓ 4. Have you written the first draft of your video essay script? Once you’ve planned things out, you’re in a position to draft your script. You need to sound enthusiastic and engaging, so write things that you agree with and don’t be afraid to include humour. You also need to take into account any audio or video clips and text slides that you present. It is important that you plan to pause your speech when you show clips or present pieces of text. The silence will help your audience take on board and process the information you’ve given them. If you’re unsure how to write a speech or are looking for some specific tips, check out our blog article How to Ace Oral Presentations and part 10 of the Beginner’s Guide to Acing HSC English: How to Prepare a Multimodal Presentation. Once you have drafted a script, you’re in a position to compile all the clips and images you’ll need for the video. ✓ 5. Have you sourced your video/audio clips and images? When you create a video essay, it is important that you include visual elements to help support your argument. Images: You can screenshot stills from DVDs, there are many sites like Pixabay and Unsplash where you can find stock photos. if you need to create your own slides of text or flowcharts, you can use some of the tools listed here, earlier in this article. Once you’ve sourced or created all of the visual and audio tools that you may need, you’re ready to produce the second draft of the script. ✓ 6. Have you edited the first draft of your script? Drafting and editing are habits you must establish in Year 12. Or even better, earlier! Editing and drafting will give you the opportunity to refine the works that you have already produced. The best way to edit a script is to read it aloud! 1. Set up a recording device – use your phone or laptop – and record yourself reading the script. 2. Make notes or annotate any parts of your script where you stumble over words or the sentences sound weird. This is possibly your ear picking up on grammatical mistakes or unidiomatic sentences. 3. Listen to the recording and read along with yourself narrating the script. Pay attention for sentences that sound incorrect and parts of your argument where you don’t develop your ideas or gloss over important information. It is also important that you don’t get sidetracked and include information that your audience doesn’t need. Remember, just because you find it really interesting, doesn’t mean that it is relevant to your audience. 4. Match your draft to your earlier story-board. It’s okay to change up the order of things, but if you edit the structure of the script, update your storyboard, too. Do my sentences sound correct? Are my sentences a good length? Am I leaving out important information? Have I given only relevant information? Once you’ve edited the script, you’re ready to write the second draft of your script. ✓ 7. Have you written the second draft of your script? Make sure that you write the second draft from scratch. It’s really tempting to take the original document and replace some sentences and drag other ones around. But that isn’t going to allow you to make big changes. Writing the 2nd draft in a blank document or handwriting it out in full gives you the opportunity to make large changes – you will be more willing to cut out parts that don’t work or rewrite them rather than trying to make parts of an argument that don’t work, work. For each section, ask yourself how can I implement these changes to make it better for the viewer? ✓ 8. Have you rehearsed your script and made any final edits? Editing is an ongoing process. It can often take many iterations to get a script right. Rehearsing your script a few times is a good way to continue polishing your script. Rather than rehearsing a script in front of a mirror or to an empty room, do it in front of an audience and record it. You can record the video or just the audio. It doesn’t need to be a high-quality recording. Just something that you can use to evaluate what works and what doesn’t work in your script. Does my argument make sense? Have I supported my argument? What could I have made clearer? What didn’t I need to include? Did I speak clearly? Was I speaking too fast or too slow? Finally, ask them if they can summarise your argument. This will tell you how well you have presented your ideas to an audience. Make sure you write down this feedback. Now, listen to your recording and read through your again, like when you edited the first draft. This time, also consult the feedback notes you received from your rehearsal audiences. Make sure you mark up the parts of the script that your audience felt could be improved. Use these annotations to write your final script. Give your final script a rehearsal or two. Make sure that it comes in at the correct length. Check it against your storyboard again and update the storyboard if you need to. You’re now ready to record your audio and/or video. ✓ 9. Have you recorded your video and audio? No background noise. You’re recording in a quiet space with no – or at least very minimal – ambient noise. Background noise can very easily be distracting or drown out your voice. The volume is correct. That you’re speaking at the correct volume. If you’re speaking too loud, your voice will distort. If it is too quiet, your viewers won’t be able to hear you properly. You won’t be interrupted. You don’t want to be interrupted or disturbed and have to start again. You don’t want to start sounding frustrated or anxious in your subsequent takes. Record one take – you don’t want to be aligning several chunks of audio with all of the visual elements. If you are including video of you speaking, you may find it easier to record one long take and then cut it down. The more sections of audio you have, the more difficult the editing process. Lighting: You want to ensure that the lighting in the room is correct. You don’t want it too dark – your audience won’t see you properly. Or too light, as it will make the video look washed out. Camera position: You want to make sure your camera is stable and is aimed as you need it. It will be a good idea to make a few test shots. If you’re recording on a mobile, remember to set it for landscape and not portrait. Camera angle: Try to have the camera aimed level. Unless you are trying for a specific stylistic effect, it can be distracting to have a video shot at low or high angles. Audiences like to be able to look directly at a video of somebody addressing the camera. Think about how current affairs and news shows position the viewer in relation to the presenter. Make sure you set aside plenty of time to record audio and video. It will likely take much longer than you have planned. You must be prepared to troubleshoot things as they occur. ✓ 10. Have you edited your video together? The final step is where you bring all of the elements together. Producing a video may well prove to be a little bit finicky as you edit things down to the correct length. You will need to work precisely to the second as you pair up the audio with the visual elements. Note these down on your storyboard. This will be your reference for editing. Use your chosen editing software to match up the appropriate images, clips, or recorded footage with your audio-track. Watch it through to ensure everything matches up correctly before you submit it. Now you’re ready to submit! Patrick has a Bachelor of Arts (Hons. 1st Class - Australian Literature) from USYD. His poetry, short stories, and essays have been published online and in print and he regularly reviews film and other media. Patrick is the editor of the popular Matrix blog and has been an English teacher at Matrix since 2012.